This Outlander scarf, Brianna cowl pattern will knit up quick and the finished scarf will double around your neck and shoulders to keep you warm. I wanted to share with you the third pattern in my Outlander collection that has been inspired by Claire and Jamie Fraser’s daughter Brianna in season 4. 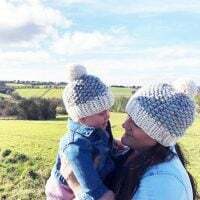 If you have been watching the Outlander TV series, recently in season four, you have probably noticed the beautiful knitted pieces that the main character Claire and her daughter Brianna wear, including shawls, wraps, scarves and fingerless mittens. Inspired by Brianna wearing a bulky knit infinity scarf, in Fraser’s Ridge, North Carolina, this scarf is knit flat and seamed. 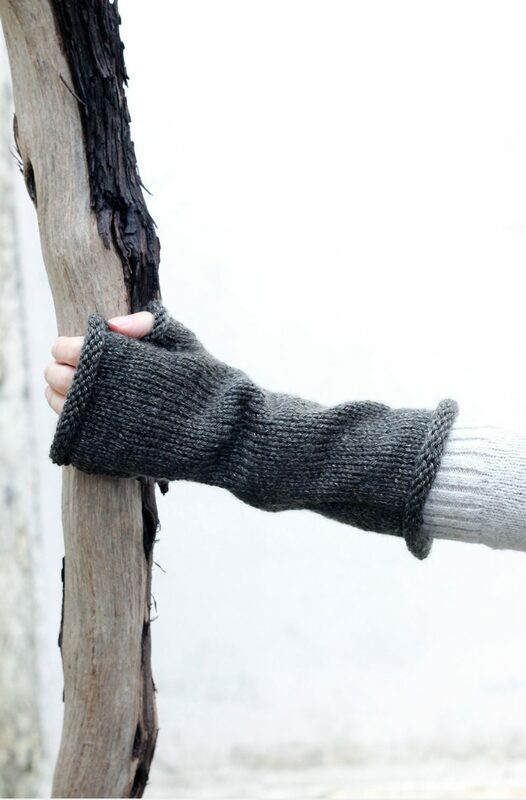 You can wear it doubled around your neck as a chunky cowl or stretched out to wrap around your shoulders for extra warmth. 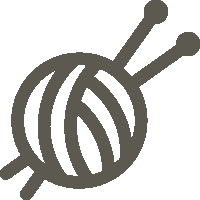 A basic knowledge of knitting is all that is required for you to get started. Both Claire and Brianna’s costumes have motivated many knitters to make shawls, infinity scarves, and more throughout the four seasons that have aired so far. The Outlander infinity scarf pattern is perfect for the colder weather, as it has been knit with bulky weight yarn (05), in Hayfield chunky tweed with wool, shade 0183 – grey. 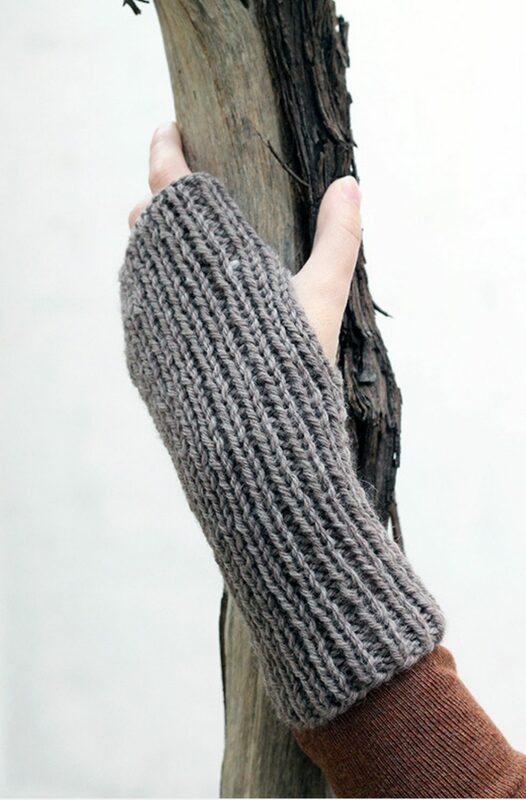 Using knit stitches, you will create an interesting design, knit flat on straight needles, then seamed to join. I knit with two strands of that yarn together and used one 10 mm (US 15) and one 20 mm (US 36) straight knitting needle to create large open stitches. 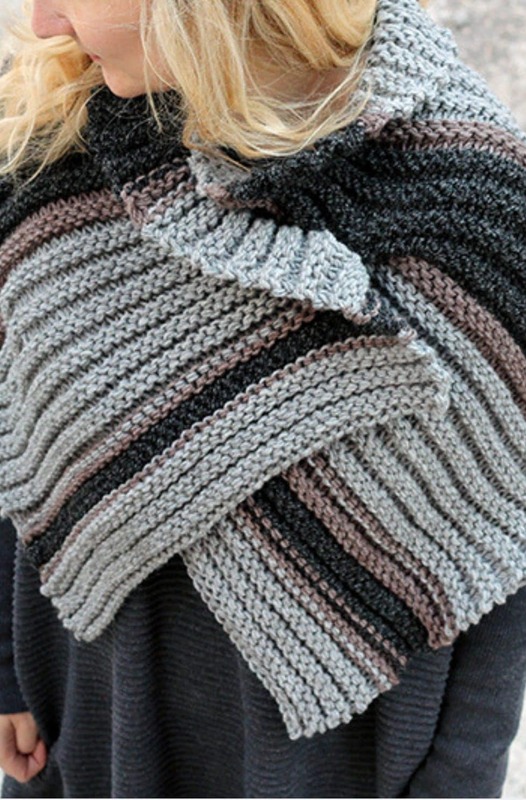 The scarf uses basic knitting stitches – knitting in garter stitch to create the design. 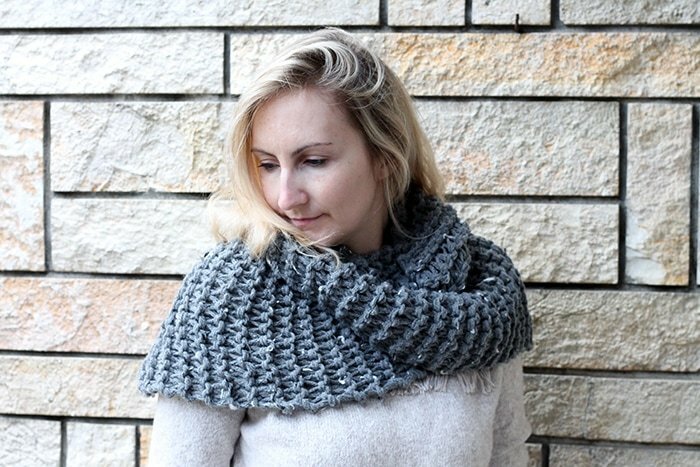 Make this beginner scarf with the easy to print out pattern below, then come back and let me know what you think in the comments or leave a review! Any bulky (05) or super bulky (06) weight yarn. I knit the bulky weight yarn with two strands together. Knit every row until the piece measures - 76 inches from the cast on edge. Sew both ends together - seam using a vertical invisible seam. Gauge - 3 sts in 3 rows in 2 inches. If you enjoyed making the scarf, I’d love to see yours on Instagram, be sure to tag me @handylittleme. Why the different needle sizes? I don’t see a reference to either in the pattern. Hi, please can you tell me how many balls of the Hayfield chunky tweed I would need to make the Outlander Scarf Brianna Cowl Pattern ? The pattern states 2 skeins – sorry new to knitting so I don’t know how to convert it!